He’s a real estate stalwart, a 41-year veteran of the business. His name is known throughout the Roanoke Valley where he has been highly visible, serving on many boards. His protégé and business partner is a self-described spreadsheet junkie with a creative side. He thrives on crafting marketing plans and crunching data. Thirty-four years separate this real estate broker duo. But a generational divide isn’t stopping them from taking on some of the Roanoke Valley’s highest profile commercial real estate projects. 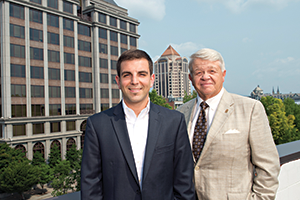 Dennis Cronk and Matt Huff are building a reputation in Southwest Virginia’s real estate community as a formidable team. Cronk, 64, co-founded downtown Roanoke based Poe & Cronk Real Estate Group in 1987. He has a slew of real estate achievements under his belt. Cronk has served as president for both the National Association of Realtors and the Virginia Association of Realtors and was inducted into the Hall of Fame of both of these organizations. Huff caught onto the business quickly. Before long, Cronk came to Huff with their first team project, and “we really clicked right away,” says Huff. Since then, the pair’s joint portfolio has grown to more than $100 million, encountering success stories and challenges along the way. About half of their transactions occur together, and they may juggle as many as 20 projects at one time. In 2013, they worked on a deal that represented the largest single manufacturing investment in Roanoke County. Cronk received a phone call from a company that was eyeing a 640,000-square-foot facility on Hollins Road that previously housed Hanover Direct, a mail order distribution center. Cronk and Huff, both representing the property seller, worked with Jill Loope, Roanoke County’s economic development director, to advertise the site nationally and globally. Huff was the boots-on-the-ground broker who showed the building to potential buyers. Cronk handled the negotiations. Loope calls the pair’s teamwork a “blend of experience and energy.” She describes Huff and Cronk as a duo that jumps into a project quickly and with strong effort, taking on multiple tasks at the same time. Huff packaged data to create marketing brochures and materials, while Cronk took on a macro-level role with deal structuring and contracting. The sale turned competitive when two bidders emerged. Ultimately, Ardagh Group, a Luxembourg-based manufacturer of packaging materials for food, beverage and consumer care brands, purchased the facility for $14.5 million, more than its $12.8 million listing price. The company invested $93.5 million, including $80 million for equipment and renovations, and last November opened the plant, which employs about 100 workers. Another challenging project was the 2014 sale of the former Huff Lane Elementary School in Roanoke to a developer who plans a restaurant and eventually two hotels at the site. The area is adjacent to Valley View Mall, a high traffic retail center. Despite opposition from neighborhood residents, Roanoke City Council voted to rezone the school property for commercial use. Huff and Cronk, along with others, made numerous concessions to pave the project’s way. For instance, to reduce the height of the five-story hotels from 60 feet to 54 feet, the builder was able to cut into the dirt at the site, lowering the structure. To get the deal done, Huff worked with the developer, NDRA II LLC, an affiliate of HMP Properties of Williamsburg, for about 2½ years while Cronk attended neighborhood meetings and consulted with city officials. The development is projected to generate more than $1 million in annual tax revenue for the city. “It was one of those that appeared that it was going to fail several times, and we brought it back to life,” Cronk says. Cronk and Huff’s teamwork has impressed others at Poe & Cronk. Thom Hubard, senior vice president, says Huff’s grasp of the market has been an asset. Huff now is executive vice president, chief operating officer and a partner at Poe & Cronk.